I'm a long time lurker on these forums, and have learned a lot from reading through the topics and articles. I unfortunately don't own any swords yet, but always wanted to get into medieval swordplay so I probably should do something about this. I have recently obtained the finances to have a custom sword made (a low budget one, the smith I intend to work with doesn't have any mass production models, handles every order as custom). I have a somewhat clear idea on the visual look I want to achieve, but I also don't want it to fall outside the "historically feasible" category. Also due to my inexperience with swords, there might be some practical issues that I'm not aware of. Any ideas or comments that help me get a better end result out of this project would be greatly appreciated. It should probably be more pointy, and narrow a bit more drastically than on the picture, but when I didn't want to redraw it once finished. I really like the half leather, half wire grip on the Windlass 15th century longsword, so I was thinking about something similar. 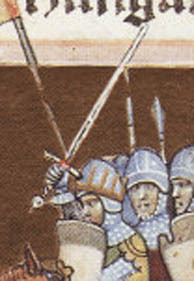 I would like a straight crossguard, possibly with pointed ends for anti-armour tecniques. What I'm not so sure about is the pommel. I guess the one on the Windlass sword is OK, but I think a different one could work better on my sword. Any suggestions on that? In period the goal of this sword would be to be effective against armoured and unarmoured opponents also. For me the goal is to use it for historic reenactment as well as studying medieval martial arts (and in the meantime as a wallhanger obviously ). What do you think about this design in terms of historic / geographic accuracy? Also would a reasonably well made (grinded, not forged, I don't have the cash for that) instance fare well in period combat? Would it be good for the drills and stuff while studying sworfighting? Also, a weird question regarding point of balance: Any of you plays tennis or squash? In these sports I tend to prefer rackets that are handle heavy and light on the head, would this translate to a sword also? Would it make sense for me to go with a CoG a bit nearer than avarage, or should I stick to the generic middle ground? Thank you very much for any comment. I strongly suggest you look at a sampling historical swords and base your design on them rather than looking at any reproductions such as the Windlass. The problem with going the route you are is that you're relying on others to interpret the data correctly without making mistakes and so your sword is going to be yet more removed from "the real thing". For example, the Windlass sword you're looking at as inspiration already has many knocks against it in terms of what is "historically plausible" and so it's only natural to think that your new sword will inherit those and perhaps add more. To that point, there are so many swords left to us from history. Why not go to that well for inspiration? Why make guesses and speculations when the answers are already there? There's bound to be something history has left us that catches your eye. That aside, your drawing is not an ideal starting point for a smith who is not extremely familiar with historical swords. If it is used as a direct guide without a lot of knowledge of historical swords, you'll get a sword created that is going to be very, very wrong. If you were to scale that drawing up from where it is, the cross-guard is going to be extremely chunky and overweight (by a factor of 10? maybe more). The blade profile is nothing like a Type XVIIIa (it needs to essentially a straight line all the way to the point with its edges not so parallel). The pommel? not so sure about the barrel-shape. I can't remember an example like that off the top of my head from the 15th century. What I would do instead is grab photos of authentic antique swords that have features you like. If you're interested in historical accuracy, don't go wild and pick many photos and make certain that they are from the same era and region and type. The mix-and-match approach is not an easy thing to do if 1) you're not experienced with swords and 2) you're interested in historical accuracy at any level. Adding one feature (such as the half-wire grip or a barrel-shaped pommel) might be all it takes to completely destroy a design's feasibility for a time period or make it completely inappropriate given another feature it has (blade or cross type, etc). I recommend you to think about the general weight. This is important before building. Your blade is 92cm and blade width 5cm and cross guard 25cm + pommel. For example the guard can quietly be 22 cm and being historical. Fuller?? POB 115 ? Is possible, but the dynamic equilibrium as the static equilibrium it is important. As you, I am learning from this site. Mine is a reflection, I don't pretend to hold absolute truth. Thanks for your replies so far. I was also aware that the edges were too parallel on the drawing as I tried to explain with "It should probably be more pointy, and narrow a bit more drastically". I'll consider some english courses . The smith I intend to contact is Peter Regenyei (http://armoury.sword.sg18.net/]. He was recommended to me by a reenactor friend, and also the biggest (possibly only?) hungarian sowrd school, the Order of the Sword recommends him on their website. Based on this, and the amount of swords he has made, he should be pretty knowledgable about them. I shouldn't be able to distract him by a not so accurate drawing. I intend to leave the overall weight, hardness of the blade and other stuff that I can't possibly have an idea about up to him. Frankly I'm somewhat more interested in the handling chatacteristis than the authenticity, my primary goal is to learn the martial art. Do you think a blade with this kind of profile would be floppy, or more rigid? Does anyone has an idea about the squash racket / sword balance comparison? Supposedly a swiss late 15th cent. sword, one of the first hits off google. The length of the crossguard and the grip is based on this. Some pictures from the Illuminated chronicle show similar fuller length and cross guard shape to what I imagined. 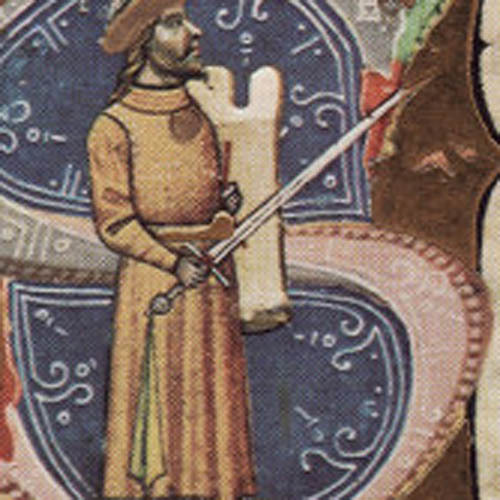 The grip / blade length suggests a longsword, but the guy holds a shield with it, so I'm not sure if it's good reference. You said that you are interested in handling characteristics, but I have to ask: What would handle better than an original that was designed to be used for this form? If you are planning on learning I:33, I would have to say, "find a sword from the height of the I:33 period and base a replica off of that." Whatever form you are going for, try to get as close to the historical original as you can.